Wests Tigers 32 (Mamana Alatini 2, Sophie Curtain, Litiana Smith-Warwick, Sophie Curtain, Jessica Whelan tries; Emily Curtain 4 goals) def. Penrith Panthers 6 (Emelia Kaafi try; Kirra Bolan goal) at Panthers Stadium. St George Dragons 64 (Filomina Hanisi 3, Mareva Swann 3, Sereana Naitokatoka 2, Ema Rainima, Leanne Toomalatai, Reva Hakopa, Rebecca Mose tries; Sereana Naitokatoka 8 goals) def. 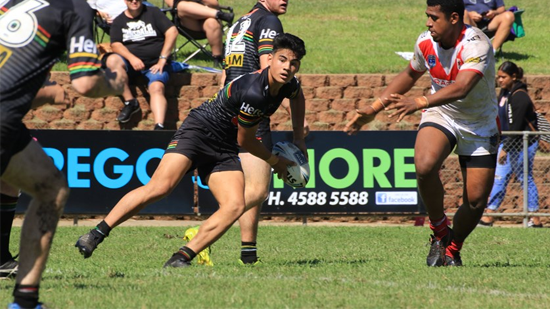 Sydney Roosters Indigenous Academy 10 (Dakota Blacklock, Illarrah Roberts tries; Dakota Blacklock goal) at Mascot Oval. Newcastle Knights 48 (Ashlee Russell 4, Olivia Kernick, Petria Symington, Zoe Coyne, Kayla Romaniuk, Jasmine Strange, Caitlan Johnston tries; Caitlan Johnston 2, Cody Campbell 2 goals) def. Parramatta Eels 4 (Tahlia Alexander try) at St Johns Oval. Illawarra Steelers 58 (Riley Scott 2, Madi Singleton, Emily Andrews, Michaela Scutts, Nancy Misa, Taneisha Roberts, Eleni Amone, Olivia Vale, Meg Buchanan tries; Olivia Vale 9 goals) def. Canberra Raiders 4 (Zali Waihape try) at Seiffert Oval. Cronulla Sharks 32 (Jamie Chapman 4, Zali Hopkins 2, Millie Graham tries; Zali Hopkins, Kyla Johnston goals) def. Canterbury Bulldogs 6 (Stephanie Baker try; Addyson Winterstein goal) at Belmore Sports Ground.